Apple has purchased the rights to "Hala" a coming of age drama directed by Minhal Baig and produced by Jada Pinkett Smith, reports Variety. The movie premiered at the 2019 Sundance film festival, and marks Apple's first purchase of the event. It's not known if "Hala" will debut on iTunes or if it will be shown in theaters. 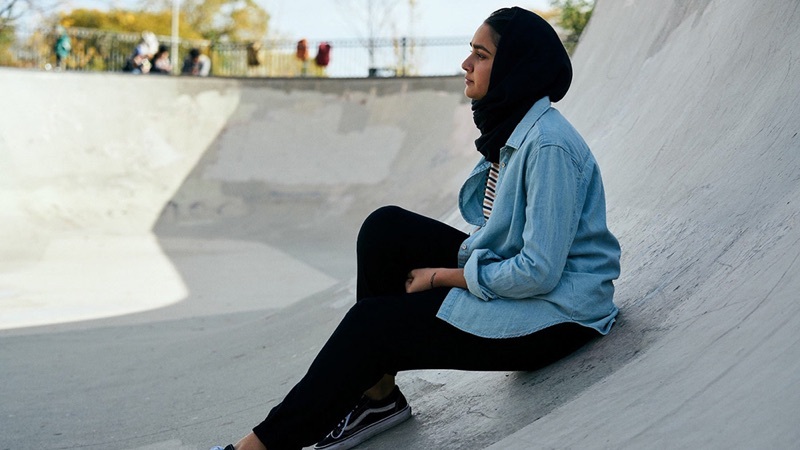 "Hala" follows the life of Hala, a 17 year old girl "navigating the conflicting worlds of her traditional Muslim household and her modern high school." "Hala is her father's pride and joy. Dutiful and academically gifted, she skillfully navigates both her social life as a teen in Chicago and her obligations as an only child to Pakistani immigrants. With high-school graduation looming, however, Hala is bursting with sexual desire. When she meets Jesse, a classmate who shares her love for poetry and skateboarding, their romance is complicated by her Muslim faith and a father who is prepared to arrange her marriage according to their family's cultural tradition. As Hala begins to challenge these customs, her parents' own lives start to unravel, testing the power of Hala's flourishing voice." Geraldine Viswanathan, known for "Blockers" plays the title role, while Purbi Josh, Azad Khan, Gabriel Luna, Anna Chlumsky, and Jack Kilmer also star in the movie. "Hala" is director Minhal Baig's second feature-length film. "Hala" is one of several movies that Apple is distributing. The company has also signed a deal with film studio A24, and it has acquired the rights to "The Elephant Queen." Apple also has more than a dozen original television shows in the works, with details available in the original content section of our Apple TV roundup. Apple and Tim pushing his agenda again. While working with China. Please. Imagine how silly you’d look if you put a similar comment on Netflix’s forum every time they released or bought a new TV show or film. Unless you’re suggesting Tim Cook is a 17 year old Muslim female, or you just saw the word “Muslim” and surmised that Apple must therefore be pushing a political agenda, I’m struggling to find how you came to your conclusion. It sounds super exciting and look at that dramatic photo of a young girl in hijab sitting in an empty swimming pool. That is drama defined! Icing on the cake: A short title which has no meaning unless you speak Arabic. Can't wait! Im sorry that you are struggling to see the obvious. Among hundreds of movies, Apple went for the dramatic story of this good muslim girl that is having a hard time developing as a person within the limits of its own religion while she lives in white western cristian society that is oppresing her famility's traditions and religion. And this movie would be obviously on the front home screen of every person who subscribe to the future apple content service. She’s awful. This is a hard no for me. Apple Ping was a better idea than this new venture for Apple. Can the chatter about Apple avoiding adult material officially end now? Will her son and daughter be in it? After Earth. Nepotism runs strong in that family. You know it’s already been cast, filmed, and premiered right?